Jean Cooke: A Modern Venus has been given a full-page review for The London Review of Books by Eleanor Birne. The exhibition at Piano Nobile Kings Place opened on 2 January 2019. 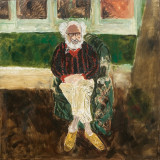 In the intelligent and well-informed piece, Birne wrote about Cooke's life and her work, and her personal struggle against her often violent husband, the painter John Bratby. Of the work, she suggested that Cooke 'could be masterful in her use of space and colour to create and control chaos'.